In a holiday-shortened trading week, mortgage markets tanked last week, casting doubt on whether the bond market’s 7-month bull run will continue. 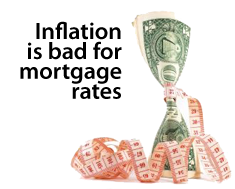 Fears of inflation caused conforming mortgage rates to rise. Last week marked the first sizable mortgage rate increase over the course of 7 days since April. The biggest reason why rates rose last week was because of concerns that the Federal Reserve’s latest round of stimulus will devalue the U.S. dollar. The Fed pledged an additional $ 600 billion to the bond markets two weeks ago and, to meet this obligation, the group will have to, quite literally, print new money. It’s Supply and Demand. With more dollars in circulation, every existing dollar is worth less. As the Fed’s pledge ties back to mortgage rates, remember that mortgage bondholders are paid in U.S. dollars. So, if those dollars are expected to be worth less in the future, we would expect mortgage bond demand to fall. And that’s exactly what happened last week — investors rarely clamor for assets whose value drops over time. The falling demand dropped down prices, and pushed up yields. Mortgage rates spiked. Analysts are calling for lukewarm data this week; none of the releases is expected to show strong growth. If the analysts are wrong, look for rates to rise again. Momentum is moving away from rate shoppers. If you’ve yet to lock in a rate, consider doing it now.